Wimmer Cemetery, an inactive but by no means abandoned graveyard east of Auburn, is one of Sangamon County’s oldest burying places. No one has been buried at Wimmer since 1934, and by 1999, the site was overgrown, dilapidated and vandalized. 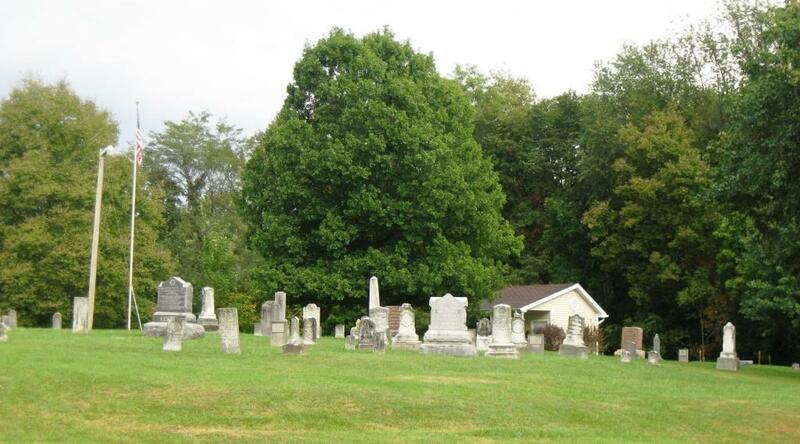 However, two decades worth of work by area residents have restored the historic cemetery. What was originally called the “Wimmer burying ground” officially came into being when James Patton deeded the site to George W. Wimmer in 1824, but at least a few people were buried there earlier. The earliest documented interment is that of Elizabeth Vancil Walker in 1819. While the friends were gathered around the dying bed, it was discovered that a prairie fire was rapidly approaching, propelled by a strong westerly wind. The grass, seven or eight feet in height, was as dry as powder. By the most vigorous exertions in keeping the end of the cabin near the fire wet, the house was saved, but all the hay stocked for winter feeding was destroyed. In the midst of the excitement the sick woman breathed her last. 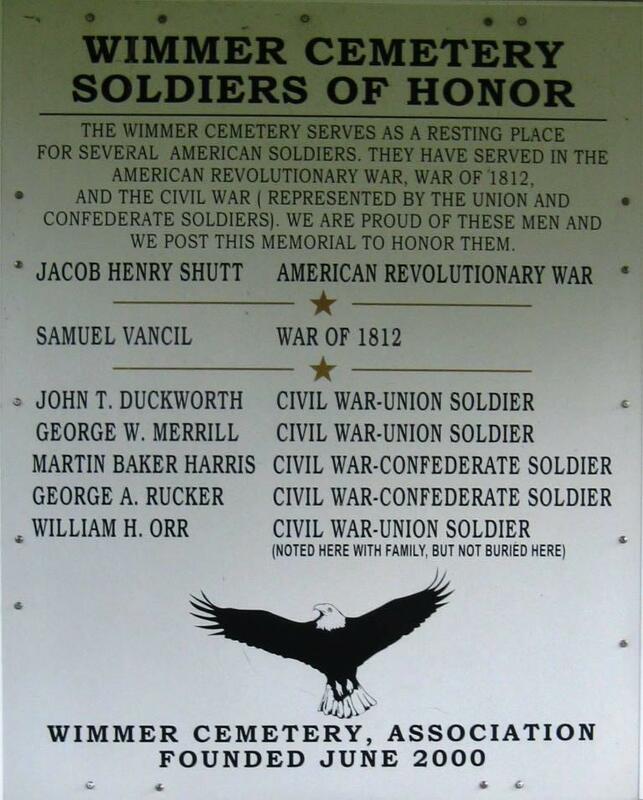 All six, along with William Orr, a Union Army veteran with family members buried at Wimmer, although he is not, are recognized by a memorial posted on the cemetery’s maintenance building. 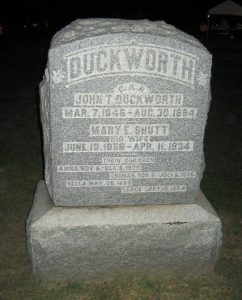 Mary Shutt Duckworth, the last person interred at Wilmer, lies with her husband and three children who died in the 1800s. In 1899, however, “Whispers from Wimmer” reports, Mary Buck donated land about a mile and a half west of Wimmer for a new cemetery, today’s Auburn Cemetery. “This competition began the decline in burials at the little cemetery on the hill near Sugar Creek,” the newsletter says. The last person buried at Wimmer was Mary Duckworth, whose funeral was held on April 13, 1934. Fundraisers to continue the Wimmer restoration effort include the annual “Light Up the Cemetery” walk, which includes presentations by costumed interpreters about some of those interred at the graveyard. Wimmer Cemetery is at the intersection of Dixon and Dickey John roads southeast of Auburn. 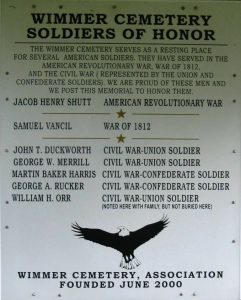 Look for a sign off Illinois 104 east of Auburn that says “Wimmer Historical Cemetery” and turn south. Hat tip: To Dan Dixon, researcher and writer of “Whispers from Whimmer,” from which much of this entry is taken. This entry was posted in Communities, Historic Sites. Bookmark the permalink.